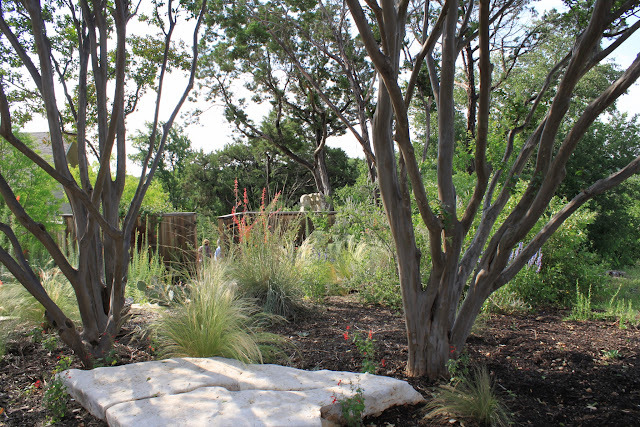 During our recent weekend in Plano I headed down to the Dallas Arboretum area for the White Rock East Garden Tour where nine neighborhood gardens were featured. The gardens on tour ranged from new homes with very standard landscaping to older homes with lots of character and personal backyard retreats. I'll feature my favorites in individual posts and combine highlights from the rest. The first garden is the Collins/Spalding garden in the Casa Linda neighborhood. This one could easily translate to my Central Texas region especially with this sign greeting us on the side of the backyard shed. 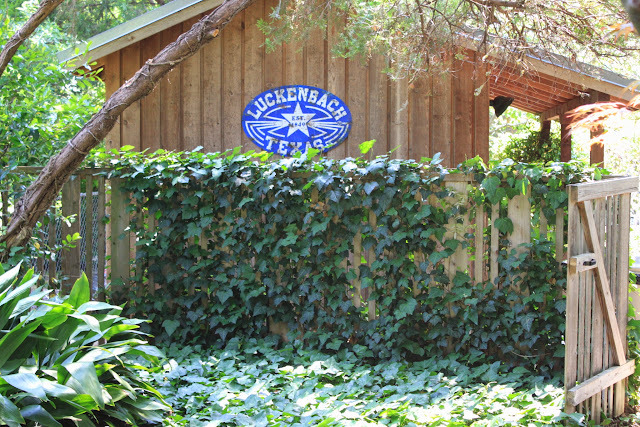 Luckenbach is close to San Antonio and a long way from Dallas. 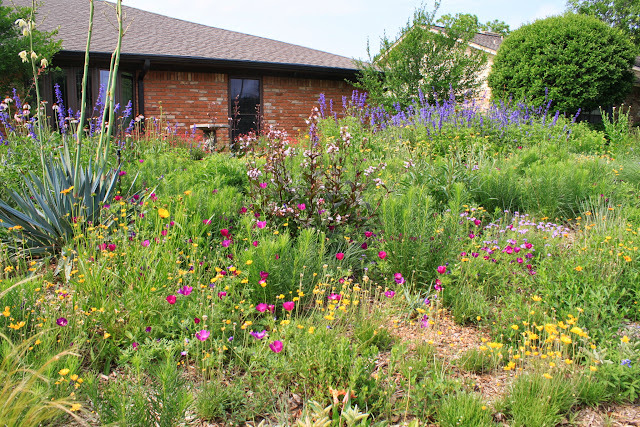 After enjoying my first visit to Michael's Plano Prairie Garden last year, I recently took a side trip to enjoy another look at this inspired home front yard prairie garden. When Michael posted about the changes he had recently completed I knew I'd want to spend more time so I headed over there on a Saturday morning for a "guided tour". This spring has been cooler with more rain than last year so I found the prairie blooming away and looking stunning. Those are native winecup flowers in the foreground. Austin blogger, author, and garden writer Pam Penick will be in San Antonio on Monday, June 17th 2013, to speak at the Gardening Volunteers of South Texas (GVST) Gardening Essentials lunch series and you are all invited. You may have heard on the news that we had record-breaking rain and flooding in San Antonio on Saturday but you probably didn't hear that the whole thing was a big surprise. As of Thursday we had a 20% chance of rain during the following two days which usually means not a chance of rain. I think the weather guys sometimes randomly post 20% chance to keep us from getting bored. 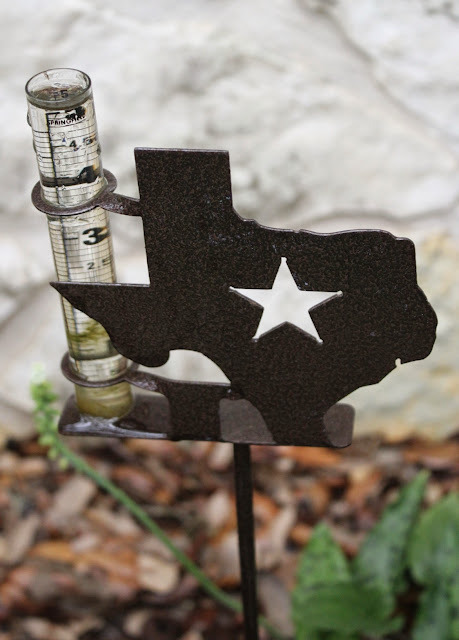 Instead it rained so much our rain gauge couldn't keep up. "Have you two met before?" asks a somewhat surprised David Cristiani of The Desert Edge just a few minutes after Heather and I began chatting about plants. Well, no, we haven't actually met in person but we have been following each others' garden progress through our blogs for a while so we were already friends in a way. And that's how I began my first visit with Heather of the San Antonio blog Xericstyle while David was in town a few days ago. 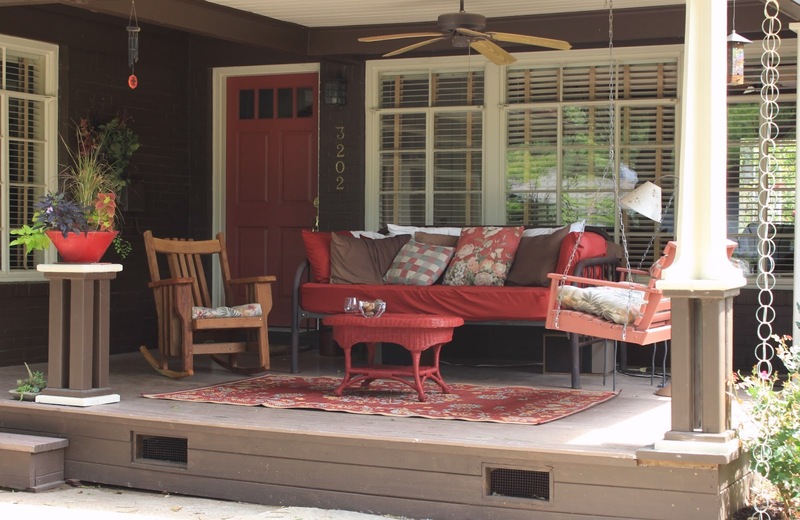 This is a modern and welcoming front porch. Those are tiny succulent planters on the door. This is the fifth and last garden in my series on the Gardens on Tour for the Ladybird Johnson Wildflower Center in Austin this past Saturday. 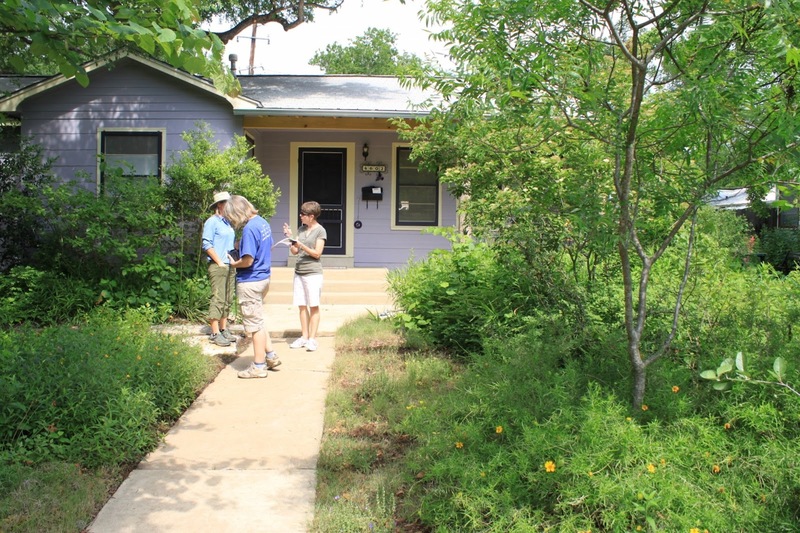 I joined Austin bloggers Pam Penick of Digging, Catherine Jones of The Whimsical Gardener, and David Cristiani of The Desert Edge from Albuquerque for a fun day of touring. You can see the Highland Terrace West garden in my previous post. It's not often you get a chance to see the same garden on tour twice in six months. This was the case with Bonnell Drive which I toured on the Garden Conservancy Open Days tour last fall. I welcomed the opportunity to visit again in the spring comparing the seasons and seeing the changes since our last tour. My goal was to focus on areas I didn't cover in detail in my previous post and I did that somewhat although the major focal points shouldn't be missed on any visit. The opuntia were blooming this time adding a dash of yellow to the silvery and green foliage visible streetside. This is the "Four and a half" post in my five-part series on the Gardens on Tour for the Ladybird Johnson Wildflower Center in Austin this past Saturday. I joined Austin bloggers Pam Penick of Digging, Catherine Jones of The Whimsical Gardener, and David Cristiani of The Desert Edge from Albuquerque for a fun day of touring. Because the garden on Highland Terrace West had so much to show I'm posting the median strip which was included in the tour in a second part. You can see the Highland Terrace West garden in my previous post. Since the median mostly foliage I can also multi-task this as Foliage Follow-Up. Foliage Follow-up is sponsored by Pam at Digging the day after Garden Blogger's Bloom Day. After the 2008 drought, the homeowner felt compelled to see if she could create a pleasing garden with many challenges: deer, no irrigation, poor soil, and rampant weeds. 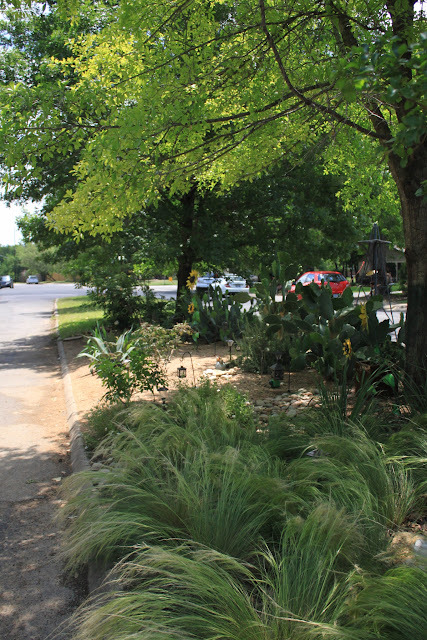 The median in front of the house demonstrates this and has become a community project for the neighborhood. This was a good idea to turn what is often an overlooked space into a garden the community can enjoy. The challenges are outlined above and below you see the results. This is the fourth in my five-part series on the Gardens on Tour for the Ladybird Johnson Wildflower Center in Austin. Last Saturday I joined Austin bloggers Pam Penick of Digging, Catherine Jones of The Whimsical Gardener, and David Cristiani of The Desert Edge from Albuquerque for a fun day of touring. You can see the third garden, Placid Place, in my previous post. After lunch we headed to Highland Terrace West and the second of the homeowner-designed gardens on tour this year. This was a beautiful garden full of ideas. 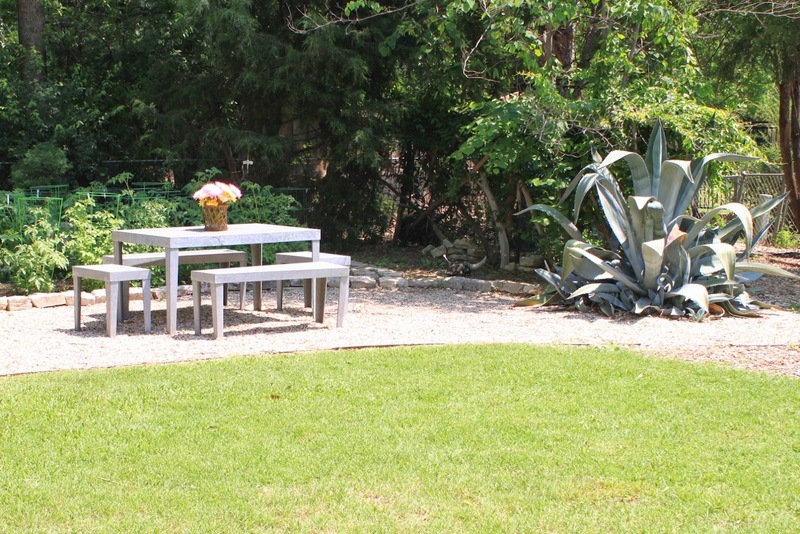 Bruce Baldwin built many of the items in the garden and Colleen Jamison handled the planting and accessorizing. 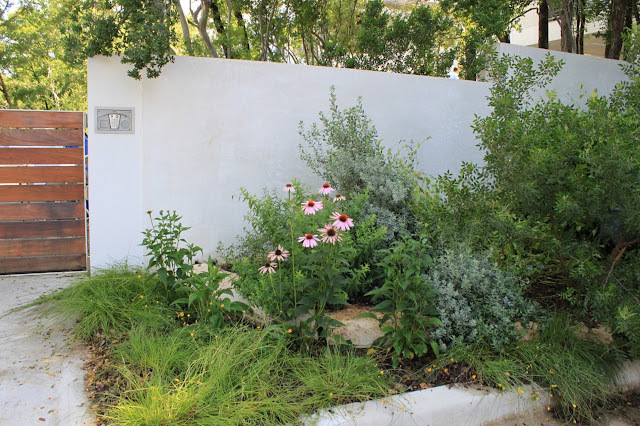 Jenny of Rock Rose spent several hours as a volunteer in this garden so check out her post for the best scoop. Pam at Digging also has a great take on this garden which is in her old neighborhood. We were greeted by this bright and inviting front porch. This is the third in my five-part series on the Gardens on Tour for the Ladybird Johnson Wildflower Center in Austin this past Saturday. 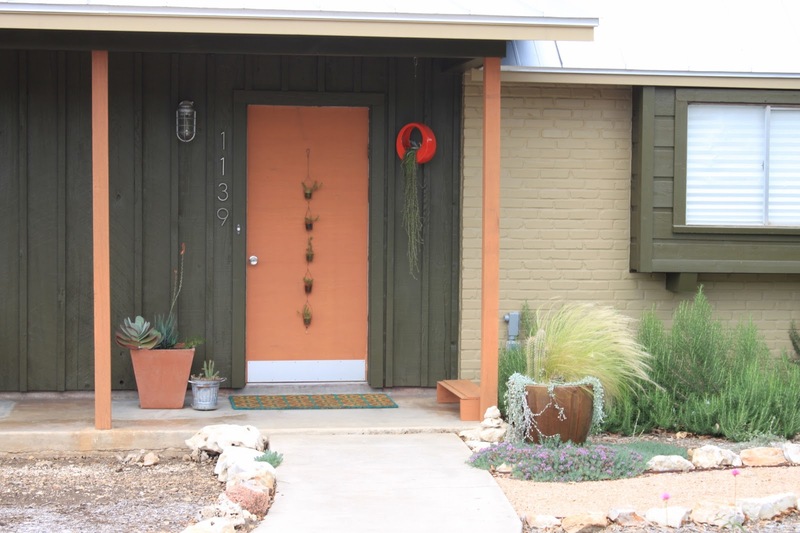 I joined Austin bloggers Pam Penick of Digging, Catherine Jones of The Whimsical Gardener, and David Cristiani of The Desert Edge from Albuquerque for a fun day of touring. You can see the second garden we toured, Westridge Drive, in my previous post. The garden on Placid Place was one of two homeowner designed gardens on the tour this year. This is the second in my five part series of posts on the Gardens on Tour for the Ladybird Johnson Wildflower Center in Austin this past Saturday. I joined Austin bloggers Pam Penick of Digging, Catherine Jones of The Whimsical Gardener, and David Cristiani of The Desert Edge from Albuquerque for a fun-filled day of touring. You can see the first garden on the tour, Kathy Cove, in my previous post. The second garden we toured was Westridge Drive. In honor of National Wildflower Week, the Ladybird Johnson Wildflower Center held their annual garden tour in Austin on Saturday. I joined Pam Penick of Digging, Catherine Jones of The Whimsical Gardener, and David Cristiani of The Desert Edge for the tour of five gardens. There's always a sense of anticipation when the gates open on a garden tour, and this tour was exceptional for its quality and mix of properties. The gardens were labeled by address so the first garden we visited was Kathy Cove. May 4-12, 2013 is National Wildflower Week sponsored by The Lady Bird Johnson Wildflower Center in Austin, Texas. I'm posting photos of wildflowers growing in a field near my house. The field is commercial property and will be developed eventually. I enjoy walking there and often collect seeds from plants to add to my garden. 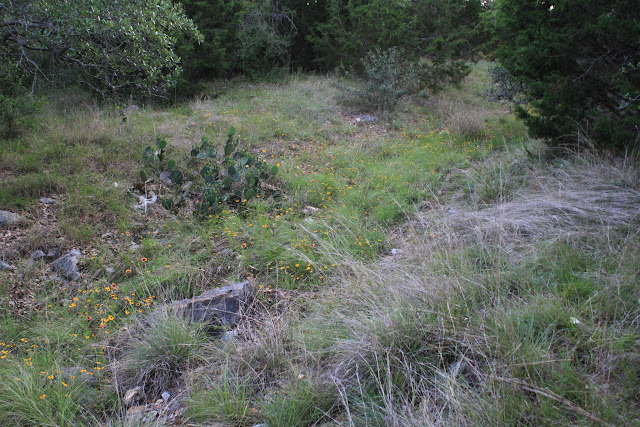 The area below is a small arroyo which feeds the creek along our backyard. When we moved home to Texas in 2008 our yard was a blank slate and I needed garden inspiration. I went looking for a beautiful, regionally appropriate landscape that worked with the strict watering guidelines imposed by our city. 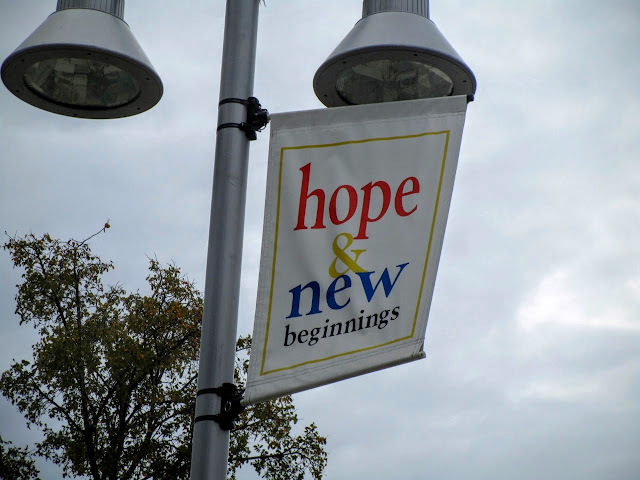 I began by checking out commercial landscapes as I was out running errands and started putting a few ideas together. 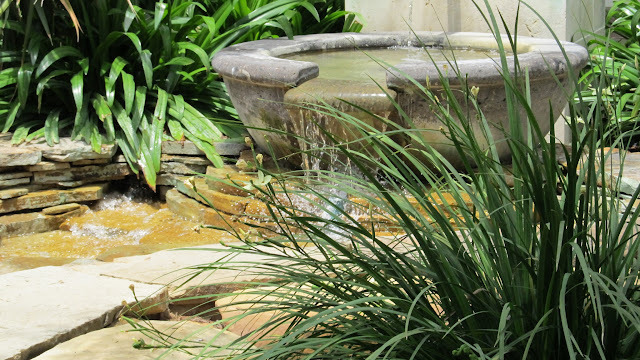 It wasn't long before I headed out to The Shops at La Cantera in northwest San Antonio and discovered one of the best spots for my landscape inspiration. 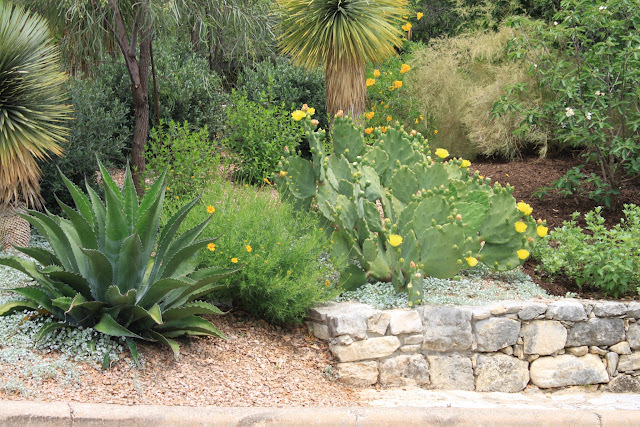 Beautifully landscaped with an emphasis on native plants and details that were unmistakably San Antonio, I was presented with possibilities that I was not even aware of. I was fascinated from that first visit and returned again and again as I put together a plan for my own yard. We've been busy in the garden this week taking advantage of the cool weather and finishing up projects before the summer heat sets in. 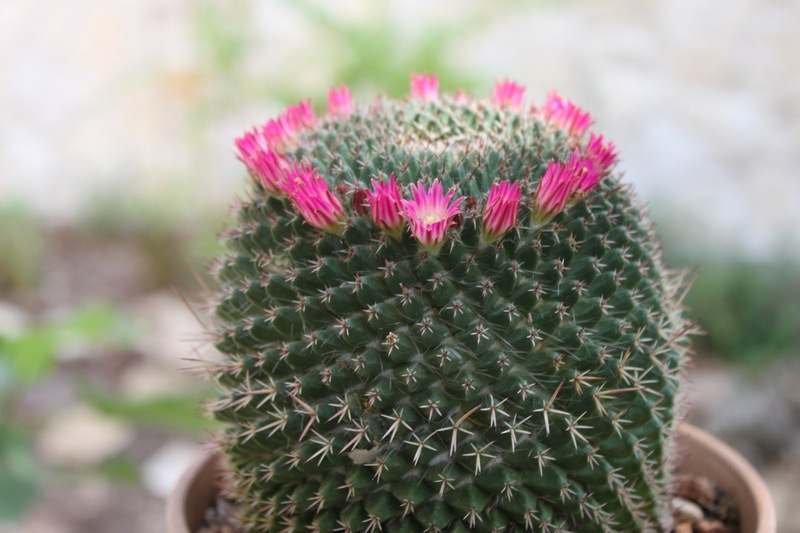 This has been a special season for cacti blooms in the garden--most are blooming for the first time. Today I'll share a few of those pretty blooms from this week. This unknown Mammalaria has produced a wreath of pink blooms around the top after two years in our collection. It is frost sensitive and spends the winter in a small greenhouse.